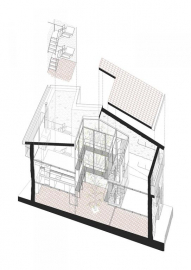 This is a village house between party walls with a long and narrow plan shape, open at the back to a yard. In time, the abandonment led to a dilapidated house. 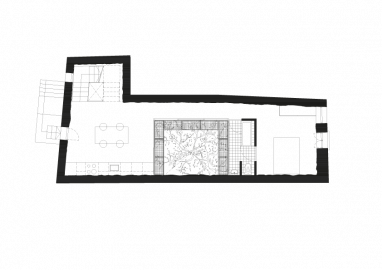 We emptied all the interior and arranged a new house around a central courtyard. Luz, the owner, wanted a house with lots of natural light and related to the outdoors and the yard. In its original condition the central area of the house lacked natural light and ventilation. 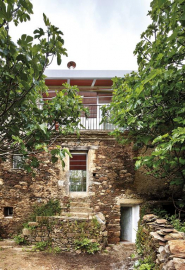 These factors, together with a extremely low budget, led to a strategy of simplifying and purifying the design of the project; cleaning and emptying the interior of the existing house, leaving the stone façades and rammed-earth party walls while arranging the new house around an interior courtyard. This time, our approach comes from the use of the local know-how and reliability of natural materials adapted to the economical and geographical context. Surrounding the courtyard, 4 floors are built at different levels. 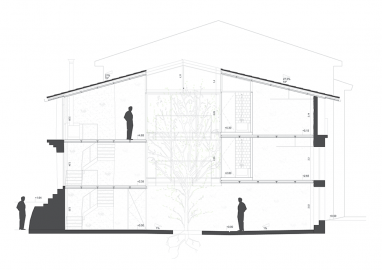 Each of these contain a single use; kitchen, living room, bedroom 1 and bedroom 2. 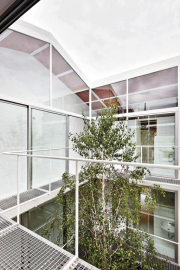 The courtyard is dominated by a birch tree, so that the living room and kitchen are among the green interior and the green garden. The stairwell, located in the living room and kitchen, prevents circulation near the bedrooms, which are located between the courtyard and the main facade. Each room has its own bathroom, fully open to the patio and with dual access from the room and the corridor itself. 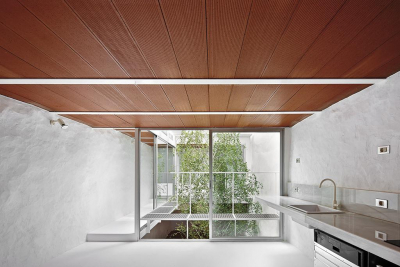 The lining of the bathrooms is white gloss glazed tiles that reflect the tree leaves and the light of the courtyard, doubling the effect of the trees presence. 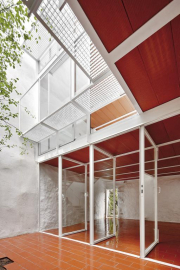 Theres a metal framework walkway that goes around the courtyard, allowing a double inner-outer circulation. Besides functioning as a circulation element, it can also serve as a bench where you can sit, extending the interior-courtyard relation. The structure and construction are overwhelming in its simplicity. 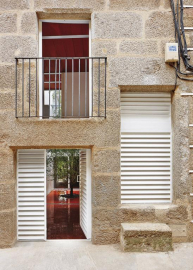 The work shows its pure materiality and deliberately contrasts with irregular textures of rammed-earth and stone, which have been whitewashed. It has sought an atmosphere where the red color of the ceramic and the intense green birch predominate, and it s the light that bathes these materials through various shades of the walls and floors throughout the day. The ceramic material itself gives us the desired texture and warm color, so paintings or false ceilings were unnecessary. 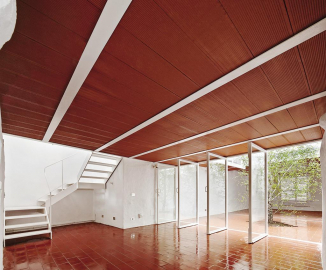 The entire ground floor is covered by a large blanket of red tiles, which goes along with the ceiling and defines the basin of the tree. In the rear of the ground floor is the summer living area. This room is designed so that it can be fully opened to both the courtyard and the garden, to enjoy the cool breeze in the summer when the sun hits hard. Choosing a deciduous tree guarantees us a shadow in the hottest season, while in winter lets in the sun to heat and light the rooms, limiting the use of heating and cooling systems. 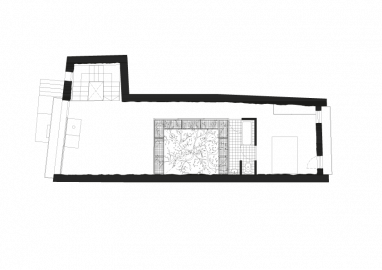 It also works as a visual filter between spaces. 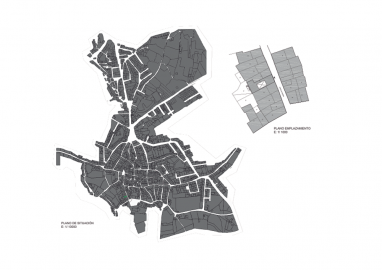 Using local materials lowers ecological footprint.